Sparkling after the holud treatment and decked in their wedding finery, the bride and groom sail towards the ceremony that marks the beginning of a new chapter in life. With the bride’s family responsible for the wedding function, the groom and his family head to the selected venue. Bor Jatri & Bor Boron – The groom (and his gang’s) journey to the bride’s home/ wedding venue is the bor jatri (groom journey). At the venue, the groom is welcomed by the bride’s mother (photo below) and other elders in the traditional method of showering blessings accompanied by the sound of conch shells and the ullu. The groom is blessed – this is called boron – before the entire groom’s party is given refreshments and the royal treatment. Saat Paak, Shubhodristi, Mala Badal – Remember all those interesting and partially strange Bengali wedding scenes you’ve seen in television serials and movies? Now is when all of that happens, sans the lighting, thunder and melodrama. Once the groom and his party have arrived, he is escorted to the marriage area – a sacred space – where an elder person from the bride’s side gifts him the wedding attire. Once he has changed into that, the fun part of the wedding begins. The groom stands near the wedding space and the bride – her eyes covered with a pair of betel leaves – is carried to him. 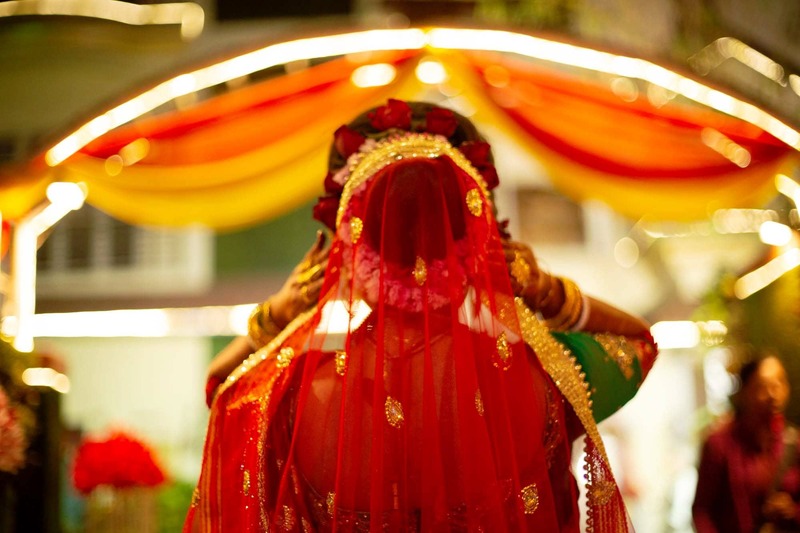 After saatpaak (seven circles) of the groom – this is a heavy duty job for those chosen to carry the bride – the bride removes the betel leaves and the couple sees each other for the first time on the wedding day! This moment, called shubhodrishti (auspicious viewing) is THE MOST ROMANTIC moment of the Bengali wedding and the loudest too what with the relatives hooting and shouting in delight! And then comes the bit where the bride and groom are in danger of falling, being trampled on, losing their head accessories or the dhoti (in the groom’s case!) if either or both sides are blessed with young and enthusiastic individuals. The mala badal (garland exchange) is often a friendly competition to see who can garland with the bride and groom being lifted (a dangerous feat!) by their friends. More often than not, the mala badal competition ends with some frantic scolding by elders eager to get on with the wedding. Sampradan, Havan, Saat Paak, Sindur Daan – Getting married is serious business and after all the fun and frolic, it is these next set of rituals that set the emotional tone. As the pandits performing the ceremony, guide the father of the bride through the sampradaan (handing over the bride), an action most Bengali families consider an honour. You’ll spot several wet eyes and tears making tracks down a few caked cheeks. The journey of the tears continues as the pandits light the havan to perform the puja – this gesture is to purify the atmosphere, pray to the god of fire and seek divine blessings at the beginning of a new relationship. During the havan, the almost-married couple goes around the fire seven times, making seven promises to each other. And then comes the most beautiful moment of the wedding – this is when the groom fills the parting in the bride’s hair with shindoor (vermilion). Bashor jaaga – Every wedding comes with its own quirky set of rules that have been made based on stories that are today seen as folklore. A Bengali ceremony is no different! One would think that the wedding would be followed by the much-awaited wedding night. Nope! Not in the case of Bengalis. Post wedding, the married couple stay awake the entire night, surrounded by friends and cousins to ensure there is no hanky panky! The bashor jaaga is also a golden opportunity for the groom’s sisters-in-law to demand some gifts! Stand guard at the door to the room and don’t let them enter until the groom shells out some moolah! Bashi biye & Bidai – The baashi biye (stale wedding) is a custom followed in some families. In this, the couple has a quick wedding the morning after and before the bride departs from her maternal home. A rather emotional moment for all involved, a few friends have said this to be the most nerve-wrecking part of the wedding rituals. “I was excited about the wedding and going to my new house but at that moment, during the bidai, all I could think about was leaving the secure family and household I had grown up. There is a sense of loss that is unexplainable,” said a friend. Kaalratri – Did I mention that the bride and groom do not get to enjoy their wedding night yet? The next night of abstinence is called kaalratri and the couple is not even supposed to be in the same room or get a glimpse of each other at this point! Bou Bhaat & Reception – Time to officially initiate the bride into the family! And what better way to do it (apparently) than to get the bride to cook a meal and serve it to the elders of the family. Luckily for the modern-age bride, she either has to only make the payesh or just serve the elder men of the family. This is done after the bou bhaat ritual where the groom hands over food and clothes to his wife, promising to care for her, forever. A reception party is organised this night in honour of the couple. Wheeeeew… that was a detailed list! Hope this was enlightening enough for you. I’ve skipped the nitty gritty of each event to keep you from reeling underthe burden of information. But just to give you a heads-up, if you intend to stick around longer as a guest, you might also get to witness the functions on the eighth day after the wedding. Do share your thoughts in the comments section below. You can also connect with me on Facebook (click here) and Instagram (click here). Note: Photographs belong to Abhisek Biswas-Reshmi Karar. Reuse of photographs without permission of either parties will be considered infringement of copyright.